Fiji has made the sustainable use of our resources on land and at sea our Number One national priority. Along with dealing with any threat to our development and the welfare of our people, and especially the threat posed by climate change. So I’m delighted to be able to share some of our experiences with you as the only Pacific nation to have developed a Green Growth Framework that is at the heart of our development agenda. That Framework sets a benchmark for every development decision we make in Fiji. And no national project proceeds without meeting the fundamental requirement that it must be sustainable. We have also incorporated the same principle into our Trade Policy Framework, which makes sustainable development the foundation of all our efforts to develop trade with other nations. We don’t want investors in Fiji who pose any threat to our environment. We want clean, green industries that are in keeping with our national priorities and objectives. Excellencies, we started out with the underlying premise that the old ways of growing our economy, of developing our nation, were no longer adequate or acceptable. Too much of what had been done had been unsustainable. In far too many instances, our resources had been exploited with little regard for the need to nurture them so that they can continue to provide the prosperity on which we all depend. As a Pacific Small Island Developing State, Fiji knows that our pristine surroundings are our ultimate livelihood and we must do everything possible to protect them. It is what draws hundreds of thousands of international visitors to our shores every year, along with the famed hospitality of our people. And because tourism is our Number One industry, maintaining our island environment to the highest possible standard is crucial to maintaining the health of our economy. It is also the foundation of Brand Fiji – the growing collection of quality goods and services that we are taking to the world. Their currency relies on the image of Fiji as a place of pristine beauty and cleanliness. A place far removed from the pollution of the industrialised world. As our current tourism slogan puts it, Fiji is “where happiness finds you”. But you can only find happiness with pleasant company – the Fijian people – and in pleasant surroundings – our beautiful islands that have made Fiji synonymous with the notion of paradise in the minds of millions the world over. It is an image that must be protected at all costs for the sake of the economic wellbeing of our people now and for generations to come. Yet sadly, we have not always done what we should to live up to that image. At sea, we have had problems with overfishing, the stripping of our reefs and of our pristine waters polluted with refuse such as plastic bags, bottles and containers. On land, we have a problem with litter strewing many of our beaches and highways. And we are currently trying to change the behaviour of our people. To get them to take personal responsibility to keep Fiji clean. Far too often in the past, developments that were patently not sustainable were given the go ahead. Whether because of corruption, ignorance or both. But all that has now come to an end. We have reached a consensus in Fiji that decisive action is needed to tackle some of these problems and set a benchmark for future development. And with our Green Growth Framework unveiled last year, that is what we have done. That framework is being incorporated into the 5 and 20-year development plans that are currently being formulated to take us well into the 2030s. In essence, it means pitting any development proposal against a basic test. Is it sustainable? And if it fails to meet that test – if the answer is “no” – then it is rejected. Firmly and unequivocally. Such an approach requires tough decisions to be made, along with considerable sacrifices. And let me give you an example. There are considerable reserves of gold and copper in Namosi, a mountain range close to our capital, Suva. These reserves, if exploited, have the potential to transform our economy and give us the revenue we need to provide all sorts of social improvements. But we remain to be satisfied that this mining can go ahead without damaging the local environment or having a negative impact on the residents of our biggest city. And so the project is on hold until we can be sure that Namosi poses no threat to the environment and the project is sustainable. Excellencies, these are the tough decisions that have to be made. Because without linking economic growth with environmental protection as decision makers, we are being reckless with the lives of those we represent now and reckless with the lives of future generations. We cannot be obsessed merely with our economic performance as nations. We need a development model that is more holistic, integrated, inclusive and above all sustainable. I believe that the eight guiding principles of our Green Growth Framework are not only a blueprint for Fiji but any developing country. Excellencies, Fiji went to the Paris Climate Summit last November with a commitment to reduce our carbon emissions by 30 per cent by 2030. We intend to do this by replacing the use of fossil fuels with more alternative energy sources such as hydro and solar. And we want a far bigger commitment from the rest of the global community to tackle the causes of the global warming that is posing such a threat to us in small and vulnerable nations the world over. On own carbon emissions are a meagre 0.004 per cent of the global total. And the average Fijian generates five times less carbon than the average global citizen. But we are committing ourselves to a dramatic reduction in our own emissions over the next fourteen years for two principle reasons. Firstly, we recognise that every nation has a fundamental duty to humanity to contribute to a global solution to this crisis. And more importantly, we are deeply apprehensive – even fearful – that we have still not done enough as a global community to avert catastrophe. Excellencies, just over three months ago, the biggest tropical cyclone ever to make landfall in the southern hemisphere slammed into Fiji with winds of more than 300 kilometres an hour. Cyclone Winston killed 44 of our people and damaged or destroyed 40,000 homes, along with public buildings and infrastructure, including 229 schools. Our students are in tents or temporary shelters and we have instituted an Adopt A School Program to get them back into proper classrooms. So I would encourage all ACP members to consider adopting a school in Fiji or encouraging your civil societies or private sectors to do so. We were fortunate that our main tourism areas and our principal source of national revenue were spared. So our economy wasn’t as badly affected as we first feared. Yet Fiji is a stark reminder to the world of the frightening new era that is dawning on us all because of the extreme weather events and rising seas caused by climate change. Excellencies, there is frankly no point in canvassing the issue of sustainable development without addressing the biggest threat of all to the development of small and vulnerable nations. In Fiji’s case, providence saved us from catastrophe because Winston struck only part of the country and spared the main pillar of our economy. But we live in the sure knowledge that a similar event scoring a direct hit on the whole country could devastate that economy for many years to come. Wipe out all our hard-won development gains and make it difficult, if not impossible, to meet our 2030 Sustainable Development Goals. Excellencies, the message I am taking to all the forums of the world is simple: the cap on global warming of two degrees Celsius over pre-industrial levels agreed to in Paris is not enough. 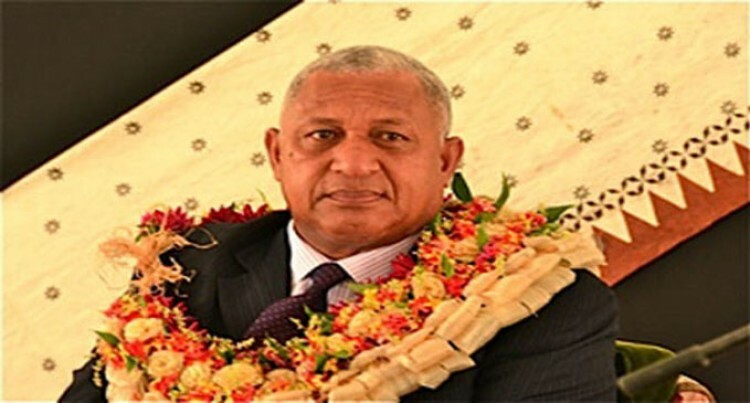 Fiji believes that the euphoria surrounding the agreement, even if it is eventually ratified, is misplaced. It is an important first step but much more radical action is needed. Because the scientists are telling us that it is not enough to save us in the Pacific from the extreme weather events and rising seas that pose such a threat to our survival. I urge you all to embrace the campaign of Pacific nations to lower the cap to one-point-five degrees Celsius as soon as possible. It is the figure laid down in the Suva Declaration issued at the end of the last meeting in the Fijian capital of the Pacific Islands Development Forum. We took it to Paris and it was rejected. But it is the only hope we have to ward off disaster, not only from extreme weather events like Cyclone Winston but the rising seas that threaten vast areas of arable coastal land. And the very existence of three of our number who are low-lying atolls – Kiribati, Tuvalu and the Marshall Islands. We are doing what we can. Fiji has offered to provide a permanent refuge to the people of Kiribati and Tuvalu –our nearest neighbours – in the event that these sovereign nations slip beneath the waves. But we need a much more concerted effort by the international community to assist us to weather a crisis that the industrialised nations have created, not us Excellencies, we need urgent access to the funding we need – in the form of grants or loans – for climate adaptation. To build our resilience. Our ability to withstand the cyclonic winds, the floods and the droughts associated with climate change. To strength our homes and our infrastructure. To maximise our chances of survival. In the case of Fiji, certain avenues of funding are being denied to us because while we are a developing country, we have been designated a middle income nation. We are essentially being punished for our success in improving the living standards of our people, even though all of this is now at risk. And as I am doing repeatedly in global forums, I appeal to you all to lobby the international community as a matter of urgency to provide small and vulnerable nations with the adequate levels of funding they need for climate adaptation. Excellencies, in this context, may I warmly thank the European Union for the assistance it is providing to Fiji. Whether it is to map the areas of our nation that are most at risk, provide support for agriculture and bolster our resilience generally. I coined the term “coalition of the selfish” to describe those nations that have been unwilling to shoulder their proper share of the burden of reducing carbon emissions. I am pleased to say that the European Union has not been part of that coalition. And indeed, has stood shoulder to shoulder with countries such as Fiji, not only in its carbon reduction commitments thus far but in assisting us with our adaptation measures. But there is more to be done. And I urge the EU to consider embracing the onepoint-five degree cap on global warming that the Pacific nations have proposed. Excellencies, Ladies and Gentlemen, I repeat: the biggest threat to sustainable development in the world today is the threat posed by climate change. Some threats we can manage and control. Nations such as Fiji can adopt Green Growth Frameworks and do everything they can to try to ensure their sustainable development. But it is the threats that we cannot control that pose the greatest danger to the wellbeing of our people and our very survival. And I urge you all to maintain the pressure on the global community for a more decisive and radical approach to the existential threat we face in the Pacific.